Craig, David P. - Component of : Early Ideas in the History of Quantum Chemistry. Craig was born 1919. Lecturer 1950-52 Professor 1955-67 David Craig was born in Australia and worked in the field of quantum chemistry while here at UCL. He moved back to Austrial in 1967 where he was Professor of Physical and Theoretical Chemistry at the Australian National University, Canberra from 1967-84. The picture reference is here. Craig was Professor of Physical and Theoretical Chemistry at the Australian National University, Canberra 1967-84, and has published in the fields of quantum chemistry, and the chemistry of liquid and molecular crystals. -------------------------------------------------------------------------------- Career Highlights Born Sydney, 23 December 1919. AO 1985. Educated Universities of Sydney (BSc (Hons) 1940, MSc 1941) and London (PhD 1949). War service: Army Captain 1942-44; Lecturer in physical chemistry, University of Sydney 1944-46; Turner and Newall Research Fellow, and Lecturer, University College, London 1946-52; professor, physical chemistry, University of Sydney 1952-56; professor, theoretical chemistry, University College, London 1956-67; foundation professor, physical and theoretical chemistry, Research School of Chemistry, Australian National University 1967-84, dean, Research School of Chemistry 1970-73; emeritus professor from 1984. 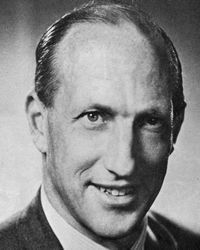 Fellow of the Royal Society 1968; Fellow of the Australian Academy of Science 1969; H.G. Smith Memorial Medal, Royal Australian Chemical Institute 1972; Liversidge Research Lecturer, Royal Society of NSW 1982; Russell Grimwade Lecturer, Royal Australian Chemical Institute 1985; Leighton Memorial Medal, Royal Australian Chemical Institute 1991. Chairman, Queen Elizabeth II Fellowships Committee 1980-84; part-time member of Executive, CSIRO 1980-85; president, Australian Academy of Science 1990-94. David Craig wing, Research School of Chemistry, Australian National University opened 1995; David Craig Medal, Australian Academy of Science inaugurated 1999. Copyright © Jan. 7, 2002 by U. Anders, Ph.D.